Sassy this is so beautiful. I love those colors and that sweet image. Stunning card Sassy with an adorable image, beautiful layers and perfect finishing touches! So sorry to hear life's not been treating you with the kindness you deserve...but pleased you're gutsy enough to not let it keep you down for long! love the card Sassy, the colours are gorgeous! Hope next week proves to be a whole lot better! 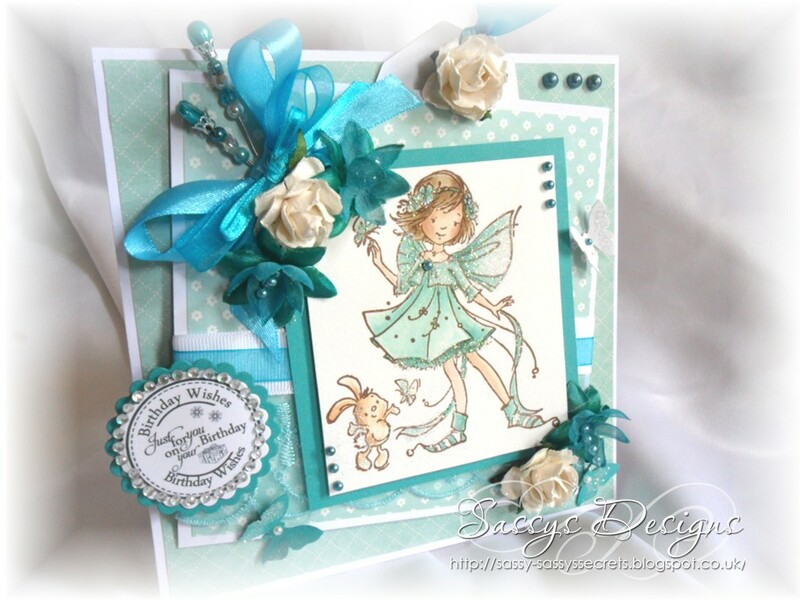 Beautiful card Sassy and such a beautiful colour choice! A beautiful card Sassy. The image is just so cute and love the colours and your fab embellishments. Hope next week is better for you but sounds like you are not going to let things get the better of you. This is beautiful Sassy, I love the colours, the image is sweet and I like those pins. Wow! this is really gorgeous Sassy! what a sweet image and your colouring is perfection! Love the scrummy papers and embellies.. it's a real stunner! Hope you have a good weekend hun! Bless...have you seen the cutest bunny ever????? He is jumping up and down, aaaaaaaaaaaaaaaaaaaaaaaaaaaaaawwwwww!!! so cute! What a lovely card, Sassy! And it's good to read that you are a wee bit better! Biggest of hugs my sweet pal! Sorry to hear that you are having a tough time, I hope that things get better very soon. Big hugs. I think you have the right attitude though, love the kick it twice as hard mentality! Beautiful card as always, love your pins and that stamp is a cutie! 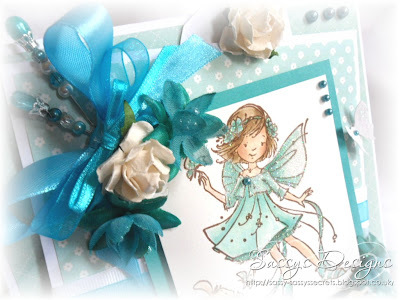 Beautiful card :) Luv the colours and the stamped image.... Gorgeouse!!! This is adorable Sassy, it's a wonderful design and I adore those colours. Your details are beautiful and your sweet Sugar Nellie is so pretty!!! How are you darling hope life it being sweet to you ! ?